Though I rarely comment on my artwork, I have had so many questions regarding this small series I will talk about how it came about. I was given a box of family items, and it included my grandmother’s bible, a small, black, well-worn innocuous bible. I was fascinated to see how I could tell which passages gave her comfort, and the pretty bookmarks and such that she used throughout, and also wild things pressed. In some ways we are quite alike that way. In any one of my well-worn books you will find leaves and images of Guadalupe or Quan Yin or family or catz or my garden, used to mark pages I want to come back to again and again. She wrote in her book, her questions, as do I. My missal from childhood was also included. It is not as well worn, as I did not spend a lifetime as a Catholic, but moved to Buddhism as a young adult. I was painting horses when I received the box of items, but had also done some emotional pieces regarding my stepdaughter, AG. One day they collided and these small studies were painted, all in one day, then the impetus was exhausted. I threw some of them away, but I like the pieces I kept. Chinese funeral paper is a very cheap thin paper with a foil that is washed in a brown paint which is quite beautiful. I combined missal passages with the funeral paper, and loved the way it printed. This form of artwork is not quite a broadside, but is collage. Broadsides were traditionally printed text on images, and were used to issue proclamations, start revolutions, or illustrate lyrics and poetry. I like the idea of a broadside more than the idea of collage; but have not learned printing. 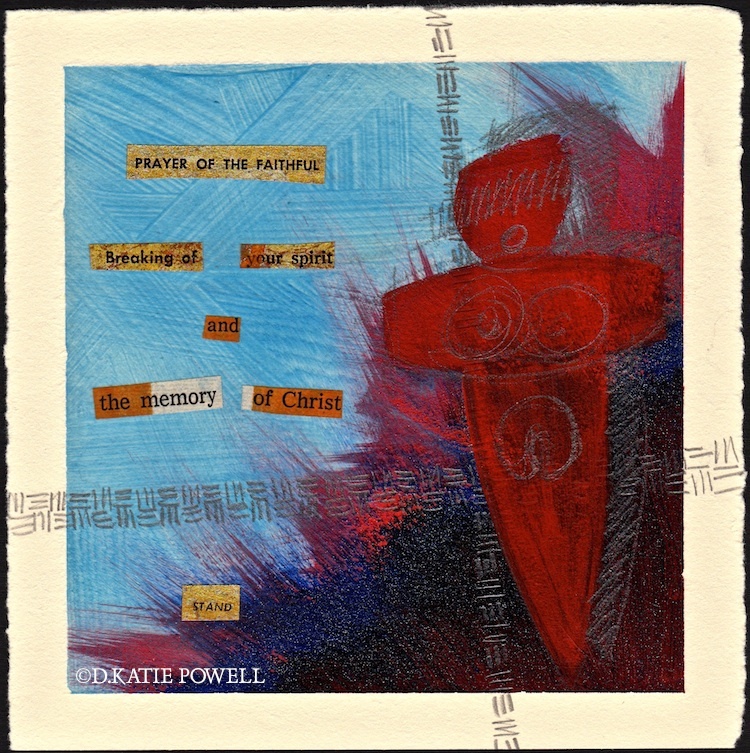 This entry was posted in acrylic, art, autobiography, courage, creativity, loss, process and tagged acrylic, broadside, catholic missal, chinese funeral paper, horses. Bookmark the permalink.